The kids have been messing about with their new toys this weekend, which we were kindly sent for them to review. They are, I am guessing, aimed at the more link market, given their packaging, but we have never encouraged the kids to think that just coz it is presented in a specific way, that it isn’t for them, so I was rather pleased that my Stuntboy son, was just as interested in Exploring the Littlest Pet Shop range as his nine-year old sister. There are a number of toys within the LPS Your World range, but they are all designed with the idea of letting kids use their imaginations to play with, and design, the way the toys look themselves. They are able to use the Netflix TV show for The Littlest Pet Shop as inspiration, or just let their own ideas and thoughts take them wherever they want to go. We were sent The Spa, the Fun Room, and Blythe’s Bedroom, as well as a couple of the little pet characters to check out and see where our kids imaginations led us…..
My son was just as keen to get involved, and dived into the Fun Room, all guns blazing, though didn’t quite manage to keep going until it was complete I am afraid: I think he got distracted by his sister…. These two toys sell at £16.00 – £19.00 depending on the retailer, and come with a couple of characters, stickers, a few accessories for the pets and instructions for construction. Blythe’s Bedroom, which we were also sent, is a larger toy, and retails at around £30.00. This also comes with information on how to put it together, stickers and accessories. Some of the pets have pawprints on the back of their heads. This enables you to transport your pet into the LPS Your World App, which has just been released for Apple and Android devices. This App, which does include in-app purchases, enables you to play with your pet for 24 hours inside the App. After this time, he needs to be re-scanned with the camera so you can play again. 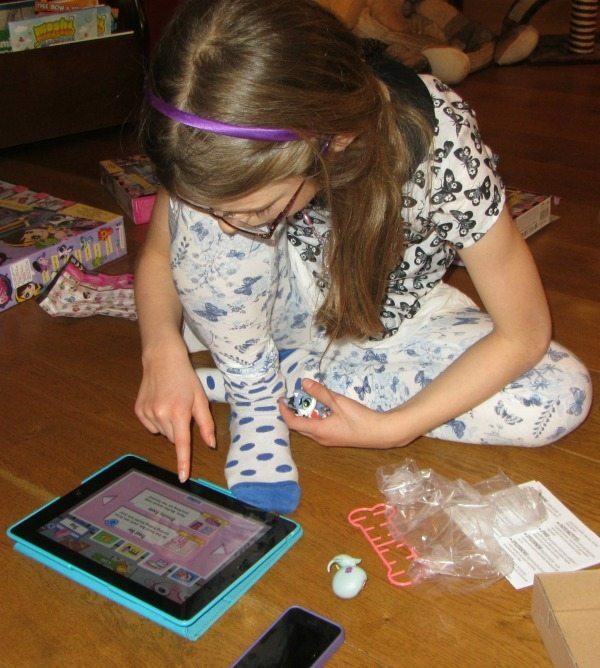 Within the App, children can explore the online world, and “level up” their pets by playing the activity based games, which include painting, and smoothie making with their little friends. 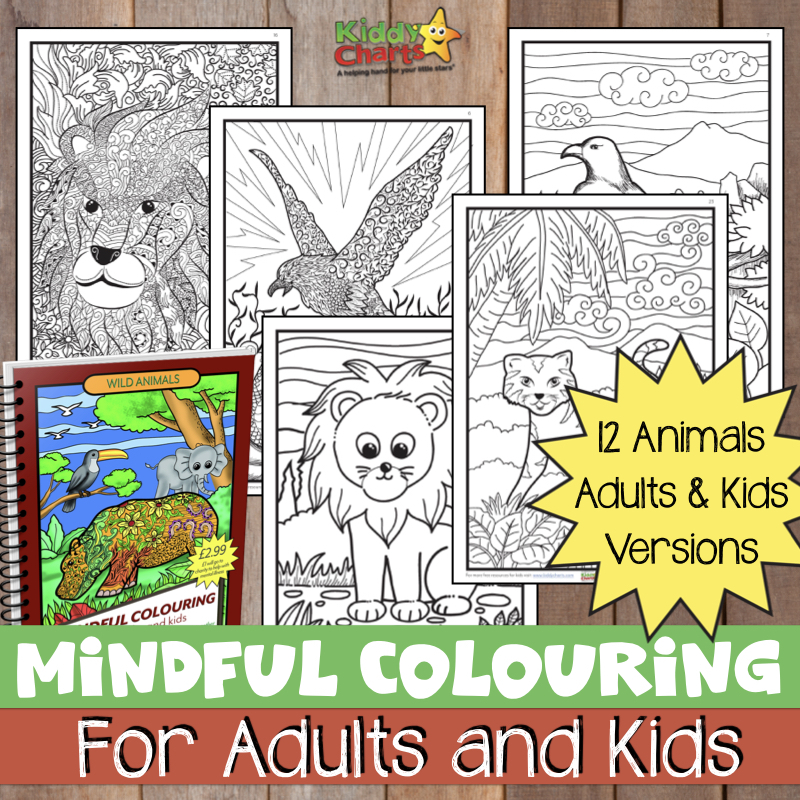 The more pets a child manages to collect, the more activities and games are available for them to play. As usual, my kids got stuck in pretty quick with their imaginative play once the toys were out of the box, and have created their own two story “house” for Blythe and her friends, sent the pets to the Spa, and even created an art room for one of the wee blighters thanks to some other toys we already had. They don’t really need too much encouragement to let their imaginations go…..
To be honest, the Fun Room and Spa, for their RRP, seemed a little on the expensive side, with only a few accessories, and a couple of plastic play items. 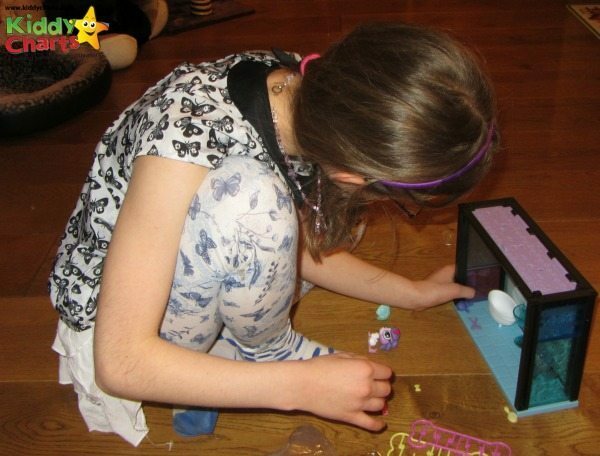 My daughter also struggled to get the accessories into the wall within the Spa, though I managed it in the end. I think most little hands would find it tough going. 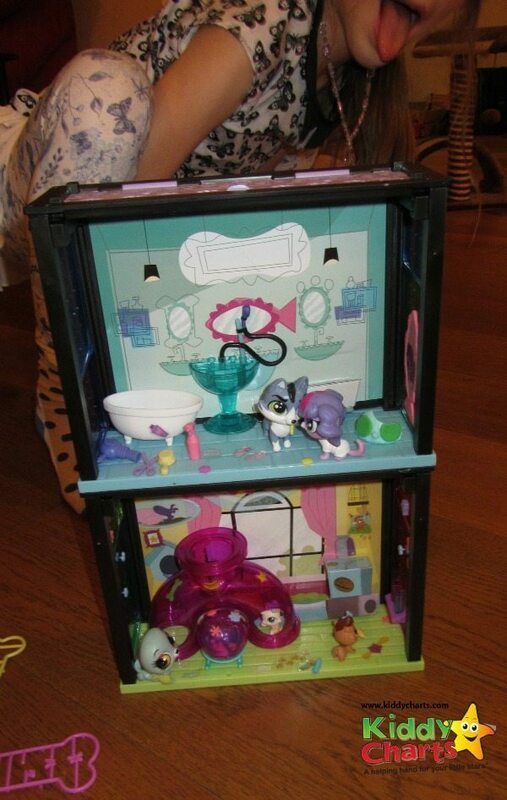 The bedroom toy seemed much better value for money, with some great add-ons, including an iPod and player which my kids loved, and more scope for them to “hang their imaginative hats on”, as it were. 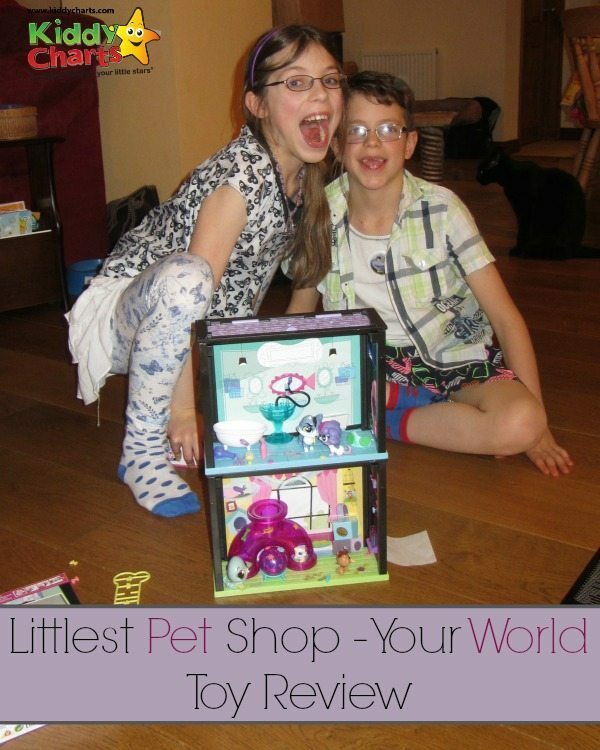 It was only after this was unboxed that they both really got into “their LPS world” and my daughter, in particular, started imagining Blythe taking her pets out for a play in the fun room, and my son dropping Hamilton Rumble off at the Spa for his latest buffing up. Perhaps this was because they needed a “human” to get their pets moving – and Blythe provided the perfect opportunity. The App proved to be more of a hit with Stuntboy than Chatterbox; he is a bit more of a screen fiend though, and is very much motivated by “rewards”, which the game is focused on. The kids found it hard to scan in their pets, and frustrating that they had to do it every 24 hours. We think that it might be worth allowing them to last that little bit longer for us slightly more impatient types. Playing and looking after your pet gives you coins, which can be exchanged for items to dress your pet up in. Watch out for your little one buying the coins though, as they do cost real money. However, you don’t need to use in-app purchases to play the game, and my kids were quite happy without them. In general, the kids seemed to like these toys, and though they are plastic, they do seem to have been made well, and aren’t in danger of falling apart after five minute of imaginative play, which can be with case with some plastic playsets. However, the Fun Room and Spa seemed to us to be a little over-priced, thankfully the Bedroom redeemed the range. My daughter gave the Spa 8/10, as you can see from the video, because she struggled with the accessories. Personally, I would give the two rooms in the range a 7/10, with the bedroom and App a healthier 8/10. The reason for the mark down is my feeling of the value for money for these two rooms. In addition, I think that these two toys may not have the long term play value; there simply isn’t too much you can do with a pet, and a plastic tunnel, for example. However, they can be constructed by 6+ kids on their own, which is no bad thing for a plastic toy. In addition, the packaging, though secure, wasn’t as difficult to get into as some we have come across. That’s a significant plus as we approach Christmas…! We were sent these toys for review, and paid for this post, however all opinions are our own, and this is a completely honest review. It seems you are helping majority of parents out there to bring there children the best gift they can ever give, seriously! I am amazed reading this post and awesome are the videos and pictures you have provided within. Now I think I can surprise my children with something interesting and amazing! good information and nice videos.